C. Kastrisios, Calder, B. R., Masetti, G., and Holmberg, P., “Towards Automated Validation of Charted Soundings: Existing Tests and Limitations”, Geo-spatial Information Science. Taylor & Francis, Submitted. F. Eren, Jung, J., Parrish, C. E., Forfinski, N., and Calder, B. R., “Total Vertical Uncertainty (TVU) modeling for topo-bathymetric lidar systems”, American Society for Photogrammetry and Remote Sensing (ASPRS). In Press. B. R. Calder, “Parallel Variable-Resolution Bathymetric Estimation with Static Load Balancing”, Computers and Geosciences, vol. 123. Elsevier, pp. 72-82, 2019. C. Kastrisios and Calder, B. R., “Algorithmic Implementation of the Triangle Test for the Validation of Charted Soundings”, 7th International Conference on Cartography & GIS. Bulgarian Cartographic Association, Sozopol, Bulgaria, pp. 569-576, 2018. G. Masetti, Augustin, J. - M., Lurton, X., and Calder, B. R., “Applications of Sonar Detection Uncertainty for Survey Quality Control and Data Processing”, Shallow Survey 2018. p. St. John's, NL, Canada, 2018. B. R. Calder, “Computer-Assisted Processing for Topobathy Lidar Data”, 19th Annual Coastal Mapping & Charting Workshop of the Joint Airborne Lidar Bathymetry Technical Center of Expertise (JALBTCX). p. Providence, RI, 2018. P. A. Elmore, Calder, B. R., Masetti, G., Yager, R. R., and Petry, F. E., “Development of Consistent and Recordable Fusion Methods Using Bathymetry Sources of Differing Subjective Reliabilities for Navigation or Seafloor Mapping”, 2018 Fall Meeting, American Geophysical Union (AGU). p. Washington, DC, 2018. C. Bongiovanni, “Estimating Sedimentation Rates Near Chesapeake Bay and Delmarva Peninsula and the Associated Implications for Survey Priorities”, 2018 Fall Meeting, American Geophysical Union (AGU). p. Washington, DC, 2018. B. R. Calder, “Low SNR Lidar Data Processing with Machine Learning”, 8th Annual International Conference on High Resolution Surveys in Shallow Water. St. John's, Newfoundland, Canada, 2018. C. E. Parrish, Eren, F., Jung, J., Forfinski, N., Calder, B. R., White, S. A., Imahori, G., Kum, J., and Aslaksen, M., “Operational TPU Software for Topobathymetric Lidar”, 19th Annual JALBTCX Airborne Coastal Mapping and Charting Workshop. Providence, RI, 2018. M. J. Wilson, Masetti, G., and Calder, B. R., “Automated Tools to Improve the Ping-to-Chart Workflow”, International Hydrographic Review, vol. 17. International Hydrographic Bureau, Monaco, pp. 21-30, 2017. B. R. Calder and Rice, G. A., “Computationally Efficient Variable Resolution Depth Estimation”, Computers and Geosciences, vol. 106. Elsevier, Amsterdam, North Holland, The Netherlands, pp. 49-59, 2017. B. R. Calder and Plumlee, M. D., “On Testing of Complex Hydrographic Data Processing Algorithms”, 2017 U.S. Hydrographic Conference. The Hydrographic Society of America, Galveston, TX, 2017. A. A. Armstrong and Calder, B. R., “U.S. Extended Continental Shelf Cruise to Map Necker Ridge and Vicinity, Central Pacific Ocean”, 2017. B. D. Andrews, Chaytor, J. D., Brink, U. Sten, Brothers, D. S., Gardner, J. V., Lobecker, E., and Calder, B. R., “Bathymetric Terrain Model of the Atlantic Margin for Marine Geological Investigations, Version 2.0”, U.S. Geological Survey (USGS), Woods Hole, MA, 2016. G. Masetti and Calder, B. R., “A Risk Index Methodology for Potentially Polluting Marine Sites (PPMS)”, Environment Systems and Decisions, vol. 34(3). Springer, pp. 391-405, 2014. J. V. Gardner, Armstrong, A. A., Calder, B. R., and Beaudoin, J., “So, how deep is the Mariana Trench?”, Marine Geodesy, vol. 37, No. 1. Geological Society of America, Boulder, CO, pp. 1-13, 2014. G. Masetti and Calder, B. R., “Design of a standardized geo-database for risk monitoring of potentially polluting marine sites”, Environment Systems and Decisions, vol. 34(1). Springer, New York, NY, USA, pp. 138-149, 2013. D. Miao and Calder, B. R., “Gradual Generalization of Nautical Chart Contours with a Cube B-Spline Snake Model”, IEEE Oceans. IEEE, San Diego, CA, USA, 2013. F. Yao, Parrish, C. E., Calder, B. R., Pe'eri, S., and Rzhanov, Y., “Photogrammetry-Derived National Shoreline: Uncertainty and Sensitivity Analyses”, 2013 Fall Meeting, American Geological Union (AGU). San Francisco, CA, 2013. G. Masetti, Calder, B. R., and Alexander, L., “Developing a GIS-Database and Risk Index for Potentially Polluting Marine Sites”, 2012 Canadian Hydrographic Conference. Niagara Falls, Ontario, Canada, 2012. B. R. Calder and Venugopal, R., “Hydrographic Data Processing on a Robust, Network-Coupled Parallel Cluster”, 6th International Conference on High-Resolution Survey in Shallow Water. Wellington, New Zealand, 2012. B. R. Calder and Venugopal, R., “Hydrographic Data Processing on a Robust, Network-Coupled Parallel Cluster”, Sixth International Conference on High-Resolution Survey in Shallow Water. Wellington, New Zealand, 2012. G. Masetti, Calder, B. R., and Alexander, L., “Potentially Polluting Marine Sites GeoDB: An S-100 Geospatial Database as an Effective Contribution to the Protection of the Marine Environment”, International Hydrographic Review, vol. 8. International Hydrographic Bureau, Monaco, Monaco Cedex, Monaco, pp. 27-40, 2012. G. Masetti and Calder, B. R., “Remote identification of a shipwreck site from MBES backscatter”, Journal of Environmental Management, vol. 111. Elsevier, http://ees.elsevier.com/jema/, pp. 44-52, 2012. J. L. Pirtle, Weber, T. C., Wilson, C. D., Rooper, C., and Calder, B. R., “Seafloor Characterization for Trawlability Using the Simrad ME70 Multibeam Echosounder in the Gulf of Alaska”, GeoHab, Marine Geological and Biological Habitat Mapping Meeting. Orcas Island, WA, United States, 2012. A. A. Armstrong, Calder, B. R., Smith, S. M., and Gardner, J. V., “U.S. Law of the Sea Cruise to Map the Foot of the Slope of the Northeast U.S. Atlantic Continental Margin: Leg 7”, Center for Coastal and Ocean Mapping / Joint Hydrographic Center, Durham, NH, 2012. S. A. White, Parrish, C. E., Calder, B. R., Pe'eri, S., and Rzhanov, Y., “Lidar-Derived National Shoreline: Empirical and Stochastic Uncertainty Analyses”, Journal of Coastal Research, vol. 62. Coastal Education & Research Foundation, Inc. [CERF], West Palm Beach, FL, USA, pp. 62-74, 2011. B. R. Calder and Rice, G. A., “Design and Implementation of an Extensible Variable Resolution Bathymetric Estimator”, U.S. Hydrographic Conference (US HYDRO). Tampa, FL, USA, 2011. J. V. Gardner and Calder, B. R., “U.S. Law of the Sea Cruise to Complete the Mapping of Necker Ridge, Central Pacific Ocean”, Center for Coastal and Ocean Mapping (CCOM)/Joint Hydrographic Center (JHC), 2011. C. E. Parrish, White, S. A., Pe'eri, S., Calder, B. R., and Rzhanov, Y., “Modeling uncertainty in the lidar-derived NOAA shoreline”, Joint Airborne LIDAR Bathymetry Technical Center of Expertise Coastal Mapping and Charting Workshop (JALBTCX). Mobil, AL, USA, 2010. A. M. Kumar, Pe'eri, S., and Calder, B. R., “Simulating an Airborne Lidar Bathymetry”, Joint Airborne LIDAR Bathymetry Technical Center of Expertise Coastal Mapping and Charting Workshop (JALBTCX). Mobil, AL, USA, 2010. S. Pe'eri, Kumar, A. M., and Calder, B. R., “Simulating an Airborne Lidar Bathymetry (ALB) System”, Optical Remote Sensing of the Environment (ORS). Tucson, AZ, USA, 2010. C. E. Parrish, White, S. A., Calder, B. R., and Pe'eri, S., “Stochastic Uncertainty Analysis for Lidar-Derived Shoreline and Comparison with New Experimental Results”, Ocean Sciences Meeting. Portland, OR, USA, 2010. B. R. Calder, Brennan, R. T., Malzone, C., Marcus, J., and Canter, P., “Application of High-precision Timing Systems to Distributed Survey Systems”, U.S. Hydrographic Conference (US HYDRO). Norfolk, VA, USA, 2007. L. Fonseca and Calder, B. R., “Clustering Acoustic Backscatter in the Angular Response Space”, U.S. Hydrographic Conference (US HYDRO). Norfolk, VA, USA, pp. 0-0, 2007. B. R. Calder and McLeod, M. A., “High-Precision Absolute Time Synchronization in Distributed Data Capture Systems”, NOAA Field Procedures Workshop. Vancouver, British Columbia, Canada, 2007. B. R. Calder, “Multi-algorithm Swath Consistency Detection for Multibeam Echosounder Data”, International Hydrographic Review, vol. 8. Geomatics Information & Trading Center - GITC, Lemmers, Amsterdam, The Netherlands, pp. 5-22, 2007. B. R. Calder, “CCOM Research Brief 2006”, NOAA Field Procedures Workshop. Vancouver, British Columbia, Canada, 2007. B. R. Calder and McLeod, M. A., “Ultraprecise Absolute Time Synchronization for Distribute Aquisition Systems”, IEEE Journal of Oceanic Engineering, vol. 32. IEEE, Washington DC, Washington DC, USA, pp. 772-785, 2007. B. R. Calder, Forbes, B., and Mallace, D., “Marine Heritage Monitoring with High Resolution Survey Tools: ScapaMAP 2001-2006”, U.S. Hydrographic Conference (US HYDRO). Norfolk, VA, USA, 2007. J. A. Goff, Jenkins, C., and Calder, B. R., “Maximum A Posteriori Resampling of Noisy, Spatially Correlated Data”, Geochemistry Geophysics Geosystems, vol. 7. American Geophysical Union , Washington DC, Washington DC, USA, pp. 1-1, 2006. L. Fonseca and Calder, B. R., “Experiments for multibeam Backscatter Adjustments on the NOAA Ship FAIRWEATHER”, IEEE Oceans. Boston, MA, USA, pp. 0-0, 2006. B. R. Calder and Wells, D. E., “CUBE User Guide”, University of New Hampshire (UNH), Center for Coastal and Ocean Mapping (CCOM)/Joint Hydrographic Center (JHC), 2006. B. R. Calder, “Uncertainty Patch Tests”, NOAA Field Procedures Workshop. Seattle, WA, USA, pp. 0-0, 2006. B. R. Calder, “On the Uncertainty of Archive Hydrographic Datasets”, IEEE Journal of Oceanic Engineering, vol. 31. IEEE, Washington DC, Washington DC, USA, pp. 249-265, 2006. B. R. Calder, Byrne, S., Lamey, B., Brennan, R. T., Mr. Case, J. D., Fabre, D., Gallagher, B., Ladner, R. W., Moggert, F., and Paton, M., “The Open Navigation Surface Project”, International Hydrographic Review, vol. 6. Geomatics Information & Trading Center - GITC, Lemmers, Amsterdam, The Netherlands, pp. 1-10, 2005. L. Fonseca and Calder, B. R., “Geocoder: An Efficient Backscatter Map Constructor”, U.S. Hydrographic Conference (US HYDRO). San Diego, CA, USA, pp. 0-0, 2005. R. Hiller, Calder, B. R., Hogarth, P., and Gee, L., “Adapting CUBE for Phase Measuring Bathymetric Sonars”, International Conference on High-Resolution Survey in Shallow Water (HRSSW). Plymouth, Devon, UK, pp. 0-0, 2005. B. R. Calder, “Multibeam Swath Consistency Detection and Downhill Filtering from Alaska to Hawaii”, U.S. Hydrographic Conference (US HYDRO). San Diego, CA, USA, pp. 0-0, 2005. B. R. Calder and Malik, M. A., “Field Verification of MBES Error Models”, International Conference on High-Resolution Survey in Shallow Water (HRSSW). Plymouth, Devon, UK, pp. 0-0, 2005. J. V. Gardner, Dartnell, P., Mayer, L. A., Hughes Clarke, J. E., Calder, B. R., and Duffy, G., “Shelf-edge Deltas and Drowned Barrier-island Complexes on the Northwest Florida Outer Continental Shelf”, Geomorphology, vol. 64. Elsevier, New York, NY, USA, pp. 133-166, 2005. B. R. Calder, “Security in the Open Navigation Surface Model”, University of New Hampshire (UNH), Center for Coastal and Ocean Mapping (CCOM)/Joint Hydrographic Center (JHC), 2004. J. V. Gardner, Dartnell, P., Mayer, L. A., Hughes Clarke, J. E., Calder, B. R., and Duffy, G., “Drowned barrier-island complexes and shelf-edge deltas on the northwest Florida outer continental self”, Geomorphology, vol. 64. Elsevier, New York, NY, USA, pp. 133-166, 2004. B. R. Calder, Kraft, B. J., de Moustier, C., Lewis, J., and Stein, P., “Modelbased Refraction Correction in Intermediate Depth Multibeam Echosounder Survey”, European Conference on Underwater Acoustics (ECUA). Delft, Delft, The Netherlands, pp. 795-800, 2004. B. R. Calder, “CUBE and Navigation Surface: New Approaches for Hydrographic Data Processing and Management”, NAVO South American Capability Building Workshop. St. Andrews, New Brunswick, Canada, pp. 0-0, 2004. N. Paquin and Calder, B. R., “DNews Configuration for Private Ship to Shore Usenet Communication”, National Oceanic and Atmospheric Adminiatration (NOAA), National Ocean Service (NOS) / Office of Response and Restoration (ORR), 2004. B. R. Calder, “PHB Evaluation Report on CUBE/Navigation Surface, Snow Passage, Memo for NOS”, University of New Hampshire (UNH), Center for Coastal and Ocean Mapping (CCOM)/Joint Hydrographic Center (JHC), 2004. R. Hare, Calder, B. R., Alexander, L., and Sebastian, S., “Multibeam Error Management: New Data Processing Trends in Hydrography”, Hydro International, vol. 8. Geomatics Information & Trading Center - GITC, Lemmers, Amsterdam, The Netherlands, pp. 6-9, 2004. B. R. Calder, “Tackling Modern Multibeam Data with CUBE”, CARIS. Hamburg, Hamburg, Germany, pp. 0-0, 2004. B. R. Calder, “Digital Security in the Open Navigation Surface Model”, University of New Hampshire (UNH), Center for Coastal and Ocean Mapping (CCOM)/Joint Hydrographic Center (JHC), 2004. B. R. Calder, Kraft, B. J., and Mayer, L. A., “Estimation and Visualization of Seafloor Uncertainty - Annual Report”, University of New Hampshire (UNH), Center for Coastal and Ocean Mapping (CCOM)/Joint Hydrographic Center (JHC), 2004. B. Brandsdottir, Richter, B., Riedel, C., Dahm, T., Helgadottir, G., Kjartansson, E., Detrick, R. S., Magnusson, A., Asgrimmsson, A. L., Palsson, B. H., Karson, J., S'mundsson, K., Mayer, L. A., Calder, B. R., and Driscoll, N. W., “Tectonic Details of the Tjornes Fracture Zone, an Onshore-Offshore Ridge-transform in N-Iceland”, EOS Transactions, American Geophysical Union . San Francisco, CA, USA, pp. 0-0, 2004. B. R. Calder and Smith, S. M., “A Time Comparison of Computer-Assisted and Manual Bathymetric Processing”, International Hydrographic Review, vol. 5. Geomatics Information & Trading Center - GITC, Lemmers, Amsterdam, The Netherlands, pp. 10-23, 2004. B. R. Calder, “On the Uncertainty of Archive Hydrographic Datasets”, Canadian Hydrographic Conference (CHC). Toronto, Ontario, Canada, pp. 0-0, 2004. L. A. Mayer and Calder, B. R., “Bathymetric Uncertainty Assessment”, Office of Naval Reasearch (ONR) , DRI, 2004. R. S. Detrick, Brandsdottir, B., Driscoll, N. W., Richter, B., Mayer, L. A., Fornair, D., Calder, B. R., and Kent, G. M., “The Tectonic Evolution of the Tjornes Fracture Zone, Offshore Northern Iceland-ridge Jumps and Rift Propagation”, EOS Transactions, American Geophysical Union , vol. 84. San Francisco, CA, USA, pp. 0-0, 2003. B. R. Calder, “Development Notes: The CCOM Implementation of CUBE”, University of New Hampshire (UNH), Center for Coastal and Ocean Mapping (CCOM)/Joint Hydrographic Center (JHC), 2003. L. A. Mayer, Calder, B. R., Brennan, R. T., Gee, L., Smith, S. M., Ware, C., Alexander, L., Armstrong, A. A., Arsenault, R., Jurley, M., Moggert, F., Plumlee, M. D., and Paton, M., “New Paradigms for Hydrographic Data Processing and Products”, International Conference on High-Resolution Survey in Shallow Water (HRSSW). St. Andrews, New Brunswick, Canada, pp. 0-0, 2003. R. T. Brennan, Ware, C., Alexander, L., Armstrong, A. A., Mayer, L. A., Huff, L. C., Calder, B. R., Smith, S. M., Plumlee, M. D., Arsenault, R., and Glang, G., “Electronic Chart of the Future: The Hampton Roads Project”, U.S. Hydrographic Conference (US HYDRO). Biloxi, MS, USA, pp. 0-8, 2003. B. R. Calder, “How to Run CUBE (Server Processing Installation)”, University of New Hampshire (UNH), Center for Coastal and Ocean Mapping (CCOM)/Joint Hydrographic Center (JHC), 2003. B. R. Calder, “Constructing Composite Chart/Bathymetry Hybrids with Fledermaus”, University of New Hampshire (UNH), Center for Coastal and Ocean Mapping (CCOM)/Joint Hydrographic Center (JHC), 2003. B. R. Calder, “Automatic Statistical Processing of Multibeam Echosounder Data”, International Hydrographic Review, vol. 4. Geomatics Information & Trading Center - GITC, Lemmers, Amsterdam, The Netherlands, pp. 0-16, 2003. M. Paton, Gee, L., Calder, B. R., and Mayer, L. A., “The Integrated Seafloor: Efficient Multi Sensor Processing and Visualization Techniques for Seafloor Mapping Data”, International Hydrographic Conference (HYDRO). Christchurch, Christchurch, New Zealand, pp. 0-0, 2003. B. R. Calder, “Comparison and Combination of Shallow Survey 2003 Datasets”, International Conference on High-Resolution Survey in Shallow Water (HRSSW). St. Andrews, New Brunswick, Canada, pp. 0-0, 2003. B. R. Calder, “On Variable Resolution Grids in R”, University of New Hampshire (UNH), Center for Coastal and Ocean Mapping (CCOM)/Joint Hydrographic Center (JHC), 2003. B. Brandsdottir, Einarsson, P., Detrick, R. S., Mayer, L. A., Calder, B. R., Driscoll, N. W., and Richter, B., “Lost in Iceland? Fracture Zone Complications Along the mid-Atlantic Plate Boundary”, EOS Transactions, American Geophysical Union , vol. 84. San Francisco, CA, USA, pp. 0-0, 2003. B. R. Calder, “How to Run CUBE (with the Baseline CCOM/JHC Implementation)”, University of New Hampshire (UNH), Center for Coastal and Ocean Mapping (CCOM)/Joint Hydrographic Center (JHC), 2003. M. Paton, Calder, B. R., and Sebastian, S., “Automated and Visual Inspection Tools for Multibeam Quality Assurance and Data Analysis”, International Conference on High-Resolution Survey in Shallow Water (HRSSW). St. Andrews, New Brunswick, Canada, pp. 0-0, 2003. L. A. Mayer, Calder, B. R., and Schmidt, J. S., “High-Resolution Multibeam Sonar Survey and Interactive 3-D Exploration of the D-day Wrecks off Normandy”, EOS Transactions, American Geophysical Union , vol. 84. San Francisco, CA, USA, pp. 0-0, 2003. L. A. Mayer, Calder, B. R., Schmidt, J. S., and Malzone, C., “Providing the Third Dimension: High-resolution Multibeam Sonar as a Tool for Archaeological Investigations - An Example from the D-day Beaches of Normandy”, U.S. Hydrographic Conference (US HYDRO). Biloxi, MS, USA, pp. 0-16, 2003. B. R. Calder and Smith, S. M., “A Comparison of the Automated Navigation Surface to Traditional Smooth Sheet Compilation”, Canadian Hydrographic Conference (CHC). Toronto, Ontario, Canada, pp. 0-0, 2002. M. Jakobsson, Calder, B. R., and Mayer, L. A., “On the Estimation of Errors in Sparse Geophysical Datasets”, Journal of Geophysical Research, vol. 107. American Geophysical Union , Washington DC, Washington DC, USA, pp. 14-14, 2002. M. Jakobsson, Calder, B. R., and Mayer, L. A., “On the Effect of Random Errors in Gridded Bathymetric Compilations”, Journal of Geophysical Research, vol. 107. American Geophysical Union , Washington DC, Washington DC, USA, pp. 1-11, 2002. B. R. Calder, Fonseca, L., and Francolin, J. 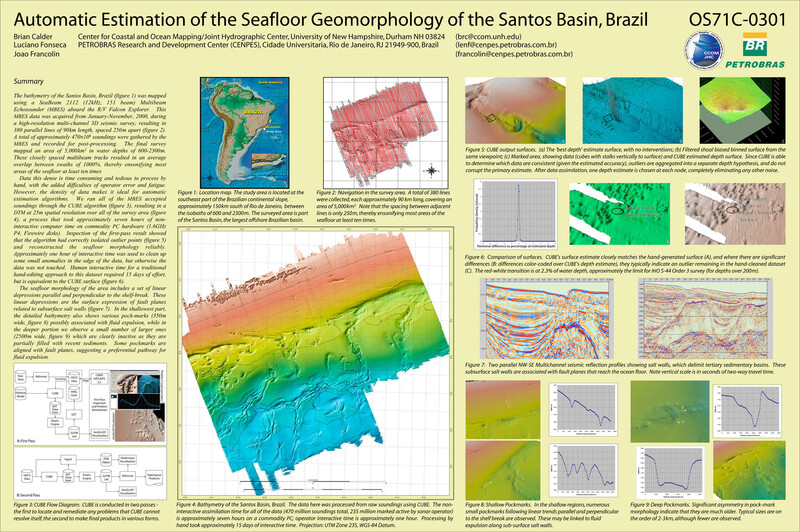 B., “Automatic Estimation of the Seafloor Geomorphology of the Santos Basin, Brazil”, EOS Transactions, American Geophysical Union , vol. 83. San Francisco, CA, USA, pp. 0-0, 2002. B. R. Calder and Mayer, L. A., “Robust Automatic Multi-beam Bathymetric Processing”, U.S. Hydrographic Conference (US HYDRO). Norfolk, VA, USA, pp. 0-20, 2001. M. Reidel, Kelley, D. S., Delaney, J. R., Spence, G. D., Hyndman, R. D., Mayer, L. A., Calder, B. R., Lilley, M. D., Olson, H. C., Schrenk, M. O., and Coffin, R., “Discovery of an Active Submarine Mud Volcano Along the Nootka Fault West of Vancouver Island”, EOS Transactions, American Geophysical Union , vol. 82. San Francisco, CA, USA, pp. 0-0, 2001. M. Jakobsson, Calder, B. R., and Mayer, L. A., “On the Estimation of Errors in Sparse Bathymetric Data Sets”, Journal of Geophysical Research. American Geophysical Union , Washington DC, Washington DC, USA, pp. 0-31, 2001. B. R. Calder and Mayer, L. A., “Automatic Processing of High-rate, High-density Multibeam Echosounder Data”, Geochemistry Geophysics Geosystems, vol. 4. American Geophysical Union , Washington DC, Washington DC, USA, pp. 0-24, 2001. B. R. Calder, “Robustness in Automatic Processing of Multibeam Echosounder Data”, International Conference on High-Resolution Survey in Shallow Water (HRSSW). Portsmouth, NH, USA, pp. 0-0, 2001. B. R. Calder, “Automatic Processing of Bathymetric Data from Multibeam Echosounders”, EOS Transactions, American Geophysical Union , vol. 82. San Francisco, CA, USA, pp. 0-0, 2001. M. Jakobsson, Armstrong, A. A., Calder, B. R., and Mayer, L. A., “Comparing Historical and Contemporary Hydrographic Data Sets: An Example from Great Bay, New Hampshire”, International Conference on High-Resolution Survey in Shallow Water (HRSSW). Portsmouth, NH, USA, pp. 0-0, 2001. M. Jakobsson, Calder, B. R., Mayer, L. A., and Armstrong, A. A., “Error Estimation of Bathymetric Grid Models Derived from Historic and Contemporary Data Sets”, U.S. Hydrographic Conference (US HYDRO). Norfolk, VA, USA, pp. 0-17, 2001. M. Jakobsson, Calder, B. R., Mayer, L. A., and Armstrong, A. 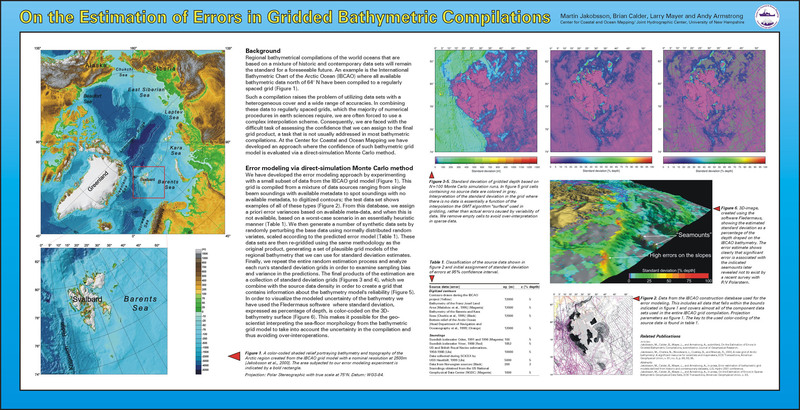 A., “On the Estimation of Errors in Gridded Bathymetric Compilations”, 2001 Fall Meeting, American Geophysical Union (AGU). American Geophysical Union , San Francisco, CA, 2001. M. Jakobsson, Calder, B. R., Mayer, L. A., and Armstrong, A. A., “On the Estimation of Errors in Sparse Bathymetric Geophysical Data Sets”, EOS Transactions, American Geophysical Union , vol. 82. Boston, MA, USA, pp. 0-0, 2001. J. V. Gardner, Dartnell, P., Sulak, K. J., Calder, B. R., and Hellequin, L., “Physiography and Late Quaternary-Holocene Processes of Northeastern Gulf of Mexico Outer Continental Shelf off Mississippi and Alabama”, Gulf of Mexico Science and International Journal. Marine Environmental Sciences Consortium of Alabama, pp. 132-157, 2001. B. R. Calder, Rzhanov, Y., Fonseca, L., Mayer, L. A., and Flood, R. D., “Statistical Processing of Multibeam Sonar Data from SAX-99”, EOS Transactions, American Geophysical Union , vol. 81. San Francisco, CA, USA, pp. 0-0, 2000.